Our "June Gloom", is officially over. 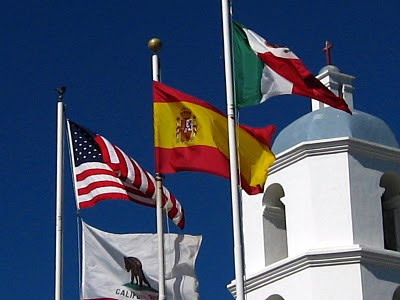 These are the flags flying at Mission San Luis Rey, in Oceanside. Just click on http://skyley.blogspot.com to see lots more sky shots. without the flags, it doesn't look like california. Seems like you have way more than your share of blue skies, Jan. Want to share? Beautiful! What a sky! And the flags are great against it. Beautiful sky and flags waving. Have a great weekend Jan.
Great sky shot Jan! The flags are so pretty against that blue sky. What great colors and contrast and the whites are not blown out! Very well composed, well done.